This industrious port is where you will try to amass a fortune with your warehouse and numerous buildings. 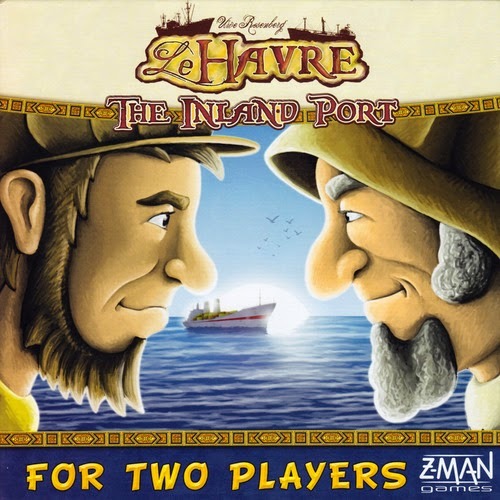 Le Havre: The Inland Port is the 2-player game for those looking for an intense half hours of so. The game features 31 buildings that will be introduced over each of the 12 rounds. Five buildings are available for purchase at the start of the game. Two or three more buildings will become available in each round. There are 4 resources (wood, brick, grain, & fish) that can be used along with money to buy buildings. Tracking the resources is done on a unique warehouse board in increments of 1 and 3. Turns are also unique. On Round 1, the first player get 2 actions and the second player gets 1 action. The turns are reversed in Round 2. The number of actions per round will change throughout the game. There are three actions in each of the first 3 rounds. Then there are 5 actions in each of the next three rounds (Rounds 4, 5, & 6). Actions in Rounds 7, 8, & 9 will increase to 7 actions. And finally, there will be 9 actions in each of the last three rounds. And again actions will alternate where the 1st player will have one more action than the 2nd player. Each player’s main game board (warehouse) has a wheel that tracks the number of actions per round and how many times an action can be used when a building is activated. Each building gives a unique action. That action can be used form 2 to 4 times each round depending on the building’s relation to the wheel. One of the things that make the game intense is the ability to activate the opponents’ buildings taking advantage of its ability and denying that action to its owner for that round. The game is over after 12 rounds. The player with the most victory points on owned buildings combined with money wins. Timing is everything in this game. Players have to build an engine to generate end game points, buy and activate buildings to maximize accumulation of resources on their warehouse board. This is a real brain burner for something with a small rule book and short game play. 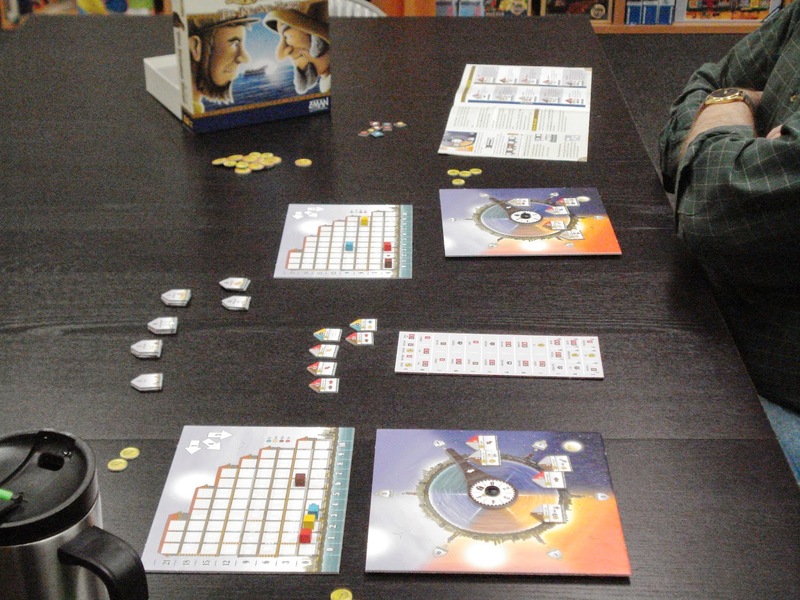 We have an open copy of Le Havre: The Inland Port available in our Store Demo Games Library for you come in and try.